This is your massage session, and it is what you make of it. Please don't hesitate to speak up during any session. If you want anything changed (pressure, areas worked, position, or if you are too hot or too cold), your therapist is happy to do what she can to ensure your comfort. You will not hurt the therapist's feelings by asking for something that will make you more comfortable. Your therapist wants this to be the best experience possible for you. What you need or want in one session, may be different in another. 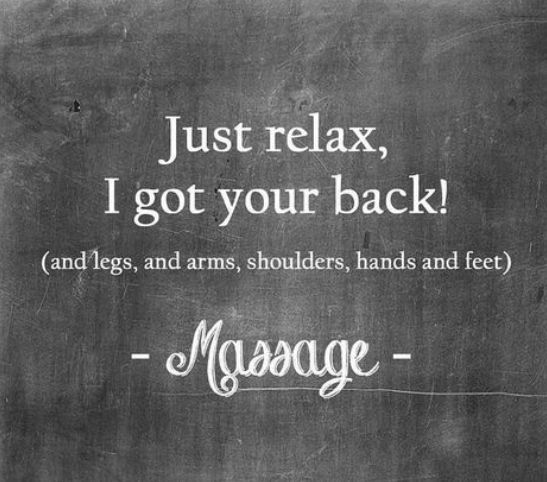 If you had a full body massage last time, but only want upper back, neck and shoulders this session, it's perfectly fine to ask for that. You will get much more out of your session if you keep the lines of communication open with your therapist. Starting superficial and working deeper within the muscle can be incredibly therapeutic and beneficial for pain, stress and dysfunction. Using several different techniques, including myofascial release, trigger point therapy, hot stones and neuromuscular techniques, creates a relaxing yet extremely therapeutic experience. Specific issues or areas of discomforts or pain are addressed. This type of massage uses deep tissue massage techniques to help improve athletic performance,endurance and mental focus. It also helps to prevent injury, reduce injury recovery time and improve circulation while removing lactic acid build up and cellular waste. Pregnancy massage is a relaxing massage that focuses on the special needs that arise during pregnancy. It reduces discomforts and concerns such as backache, swelling and leg cramps. Extra care and attention are given to the mothers comfort and stage of pregnancy. Please see our pregnancy page HERE for more information. Raindrop Technique is a gentle and safe therapy that uses therapeutic grade essential oils, which have anti-viral, anti-bacterial and anti-inflammatory properties. The oils are applied to the spine by dropping them a few inches above your back, making them feel like gentle raindrops. Special techniques are then used enhance the absorption of the essential oils. Raindrop Technique opens energy flow throughout the body, reduces stress and tension and brings balance and	harmony to the body. A modified version of ancient Chinese cupping therapy in which suction is produced on the skin in order to stimulate blood flow and promote healing. It is also used to stretch muscle and connective tissue. Combined with massage techniques, this is a great modality for athletes or anyone who likes deep pressure with less discomfort. and systemic conditions such as hypertension and diabetes. Please call in advance for this treatment. A great tool by itself, or for enhancing the effects of massage. Taping lifts the skinaway from underlying structures allowing for greater movement of the tissues and	increased circulation. Kinesiotaping can reduce pain, swelling, bruising and fatigue as well as increase athletic performance. Kinesiotaping also stimulates the nerve cells in the skin which can enhance your brains awareness of your body to help change poor movement patterns. An in depth look at your health and wellness goals and challenges. Please see our Naturopathy page HERE for more information.